My family made an unexpected trip to Idaho for my grandmother’s funeral on October 13th this year. My grandma was a lifetime resident of Bellevue, a small town that is just down the Wood River from Ketchum, Idaho. My great uncle Curt was a sheep rancher, so my family has some roots in this industry. Ketchum and the surrounding towns have long been a large sheep raising area, once the largest in the world except for Sydney, Australia. While I have been in Idaho numerous times over the years, I had never been there in the fall during the annual Trailing of the Sheep Festival. The sheep ranchers will bring the sheep down from the mountains every fall, where they have spent the spring and summer fattening up on mountain brush and grass. In the old days, they used to drive all the sheep right through the center of town, down through Ketchum, Hailey, and Bellevue to the ranches to the south where they would spend the winter. My dad can remember this happening annually. 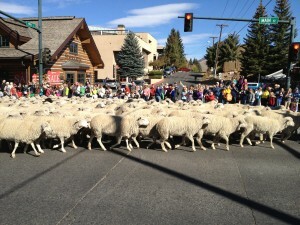 Later, sheep were moved by truck, so the site of sheep running through town had been lost. Starting in 1997, the tradition was reestablished with the Trailing of the Sheep Festival. The festival includes dog herding demonstrations, lots of lamb dishes at local restaurants, plenty of woolen items, and a parade ending with a herd of about 1500 sheep coming through town. I took a couple of videos of the event, it was pretty fun to see the sheep running through town. After spending the afternoon in the mountains, we caught up with the herd again south of town.